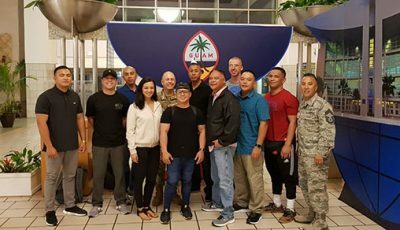 The Guam National Guard began loading heavy equipment onto the USS Ashland yesterday afternoon for transport to Saipan to continue relief operations in the wake of Super Typhoon Yutu. This is the first time that an operation of this kind took place between the two services. The heavy equipment include loaders, dump trucks, an excavator, maintenance vehicles and water buffaloes to Saipan. The Commonwealth Utilities Corp. would like to remind residents using generators to ensure that their main breaker on their home panel is turned off and for generators to not be used to energize streetlights to prevent any electrical back-feed. This poses a danger to the line crew and severe injury and death can result from these incorrectly installed generators. •	Do not use generators without the proper electrical switches. All generators should be connected through a double throw switch to protect your property and the line crews working on the system. •	Incorrectly connected generators can cause a back-feed through secondary wiring back to the overhead transformer whereby re-energizing the overhead system to 7,970 volts.